> it has taken me a while to get through this book. i bought it in Atlanta at Passion right before we left for the airport, and i was done with the first 48 pages before i even got on the plane. however, because of the way Crowder decided to write this mug, i decided to slow down my reading throughout the core. 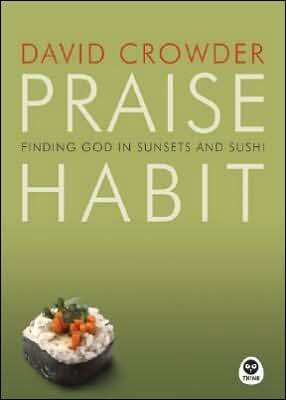 before i say anything else about this book i have to throw out some major props to Crowder. he has such a skill in creative non-fiction – the master of the slightly pointless yet overwhelmingly clever appendix/footnote. plus his wit is so enjoyable. he’s goofy enough to keep me chuckling, but that isn’t what keeps me reading. he also has some seriously stellar thoughts. the core of this book turns into a series of short dissertations about Crowder’s favorite Psalms. such awesome insight into both Crowder’s mind and, more importantly, the Bible. So many different themes and ideas too. He pulls out some great analogies. (i am partial to a terrific analogy. sometimes i like to sit around and try to come up with awesome analogies. one of my more recent favorites: motivation is like eggnog…it is rarely available, and when it is you run out in like two days.) if a group of English professors decided to come up with an Analogies Dream Team – i think Crowder would be the center. like a white Ben Wallace (fro version, of course, not dreads). but anyways. when i first got to the Psalms (pages 46-149) i started blazing through them. i made it to about the third one and realized i hadn’t comprehended the first two whatsoever because right after i finished it i’d start replacing that idea and understanding with the Psalm i was reading next. that is NOT how you should read this book. give this book a month. maybe two. take each Psalm and wrestle with it – spend a few days on each one. that is how you’ll get the most out of this book. and what an awesome view into DC’s heart. what passion and heartfelt ideas. there are spots in every chapter in this book where i was just blown away with the text. i love passionate writing. especially when it is by a skinny punk with wacky hair. (he also makes fun of his ‘about the author’ picture in the back of the book. so entertaining.) but seriously. through the silliness and ridiculous graphics Crowder is able to convey some serious soul here. when reading this book you can totally tell that he’s applying his own ideas from this book to his own life. praise habit. how seriously cool is that idea? person 1: i like to bite my nails. i just can’t stop – such a habit. person 2: oh yeah? i have a habit too. i can’t stop praising God. ps. the only part i didn’t like in this book was when he claimed that Texas BBQ was the best in the world. he likes beef. “not that Kansas City and Memphis pork nonsense.” that hurts Dave. and here i was complimenting you on your writing style…i didnt finish reading that chapter. i just couldn’t focus – let alone respect the author for saying something so blasphemous. bad form. but i will concede. i prefer beef to pork, but its only 50% meat. the other 50% is a smoke/wood/rub/sauce combo. that is where KC excels beyond the Lone Star State. phooey. Next Next post: >gnarls at the grammys.